A Pennsylvania company manufactures a wide range of agricultural equipment, including a full line of tractors, hay and forage equipment, and harvesting and crop production gear. Overtime, as the need for smart agricultural equipment increased, so too did their business, creating the need for a leaner manufacturing process. That’s when their production manager reached out to local Spanco Dealer Steve Meyer from Buy-Rite Equipment to assess their overhead lift needs. Because the large factory has many different sections, they needed to purchase and install the right equipment for each particular application. Buy-Rite carefully assessed the overhead lift needs of each department in the facility and recommended several Spanco Ceiling-Mounted Workstation Bridge Cranes to cover the entire factory. The workstation bridge cranes were a perfect solution for their busy factory floor because they required no floor space and don’t interfere with existing equipment. Each workstation bridge crane covers its own section of the factory, but they can also be extended and interconnected to run the full course of the facility if needed. Although the cranes provide workers with a constant flow of materials from section to section, the metal fabrication department required a system with much more flexibility. Their factory uses 60 million pounds of sheet steel annually, which is the equivalent of three trailer loads daily. The steel needs to be moved and used as quickly as possible to keep up with high production demands. 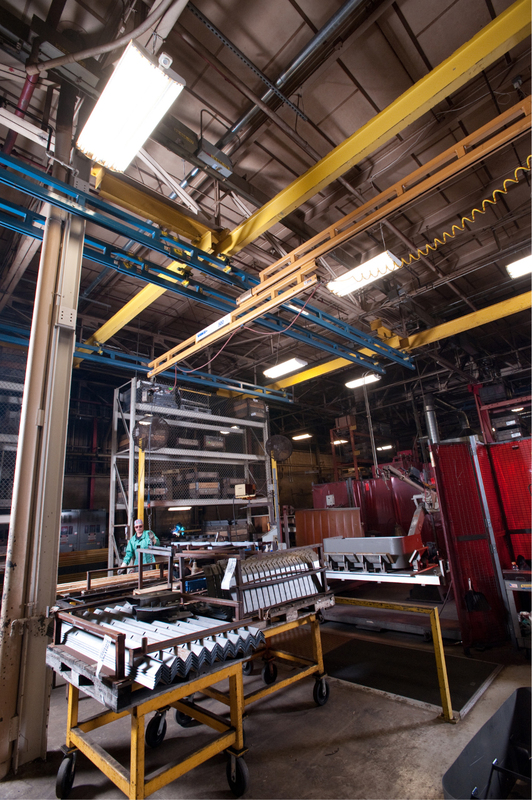 To accommodate the needs of the metal fabrication department, Spanco designed a dual telescoping bridge for the Spanco Ceiling-Mounted Workstation Bridge Crane in that particular section of the factory. The telescoping bridge provides more flexibility and extended coverage for fabrication workers who need to lift sheet steal and transport it past the runways on each side and into neighboring work areas. The telescoping bridge extends crane coverage an additional nine feet beyond each side of the runway, allowing workers to move loads beyond aisles, beneath overhead obstacles, and in and out of tight spaces. The bridge itself spans 15 feet, with the telescoping section adding nearly twice as much length. The 43-foot long runway provides extensive coverage to accommodate multiple work areas and cantilevers an additional four feet on each side to extend runway coverage. With both sections of the system designed to reach beyond work areas and into aisles and other stations, workers are equipped to handle loads up to 500 pounds from any position within the metal fabrication area. Anti-kick-up wheels keep the telescoping bridge’s movement smooth, even when carrying the maximum capacity load. The new telescoping bridge crane from Spanco has maximized their flexibility and created an effective material handling solution that supports their unique operation and streamlines productivity. It has dramatically decreased the number of workers needed to lift and transport materials and more than doubled their coverage area.